How do I help my child learn and grow? Build a solid foundation. Every child needs the basics: healthy food, good sleep, enough exercise, and lots of love and affection. It’s hard for a child to learn and develop on track without this solid base. Child development experts agree that support and nourishment in all areas of development is essential for children to reach their full potential. Studies show each area of development influences the other’s. For a child to flourish in one area, all other areas need solid skills and growth, too. Help your child learn and grow by supporting all areas of development. 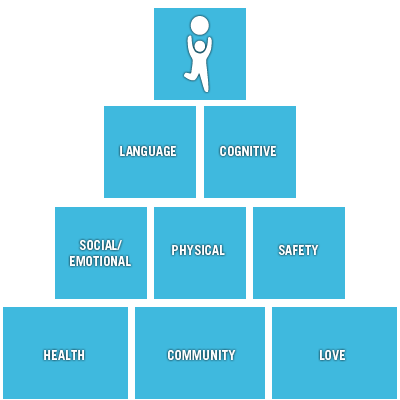 Roll over to learn more about the building blocks for healthy development.